Portuguese Stem Stitch is also known as Portuguese knotted stem stitch. This linear stitch is a variation of ordinary stem stitch that creates a knotted, rope-like line which can be accentuated by using a heavy solid twisted thread such as pearl cotton. 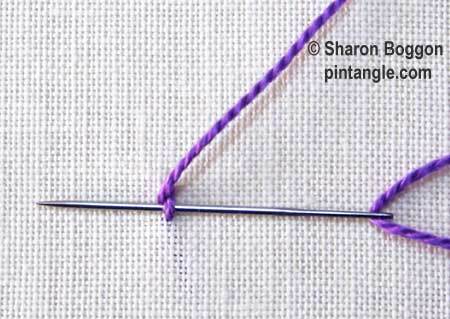 The advantage of this stitch is that just about anything stem stitch can do Portuguese Stem will do it chunkier! 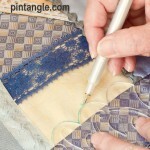 You can work it on even-weave or plain fabrics and it follows a curve well making it ideal for outlining shapes. 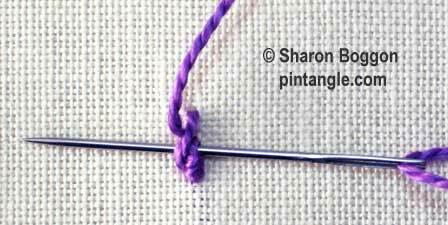 Try Portuguese stem stitch in different threads. I have worked Portuguese Stem Stitch in quite thick thread too such as anchor soft cotton which is as thick as 5 ply wool. It is effective on heavy fabrics such as denim because it is a slightly heavy stitch, which seems to stand clear of the fabric. On the other hand if you work it in fine thread it can take on a delicate organic appearance. I find Portuguese Stem stitch is best worked starting at the bottom and working towards the top. Various books say to work from left to right but I do not do it that way. Try it the way the books say but if you find you are working in an uneven manner turn the work. 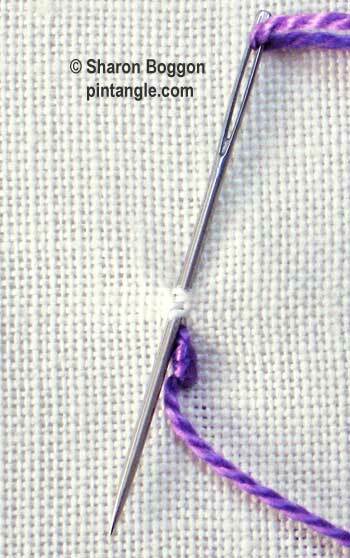 Bring the thread through from the back of the fabric and make a small stitch picking up a small piece of material as you would if you were working a stem stitch. Bring the thread out to left. The first stitch should look like this. Take the needle and thread it under the first stitch. Make sure do not pick up any fabric. You are actually whipping this stitch. It should look like this. Whip the stitch a second time. These two whipping stitches form the knot like appearance. 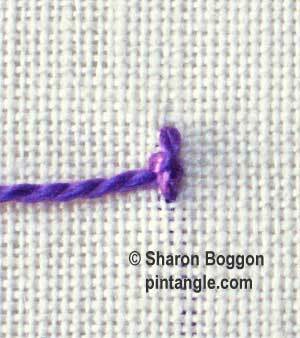 Move along the line and make a small stitch picking up a small piece of material as you would if you were working a stem stitch. Bring your thread out as illustrated. Take the needle and thread it under the stitch. 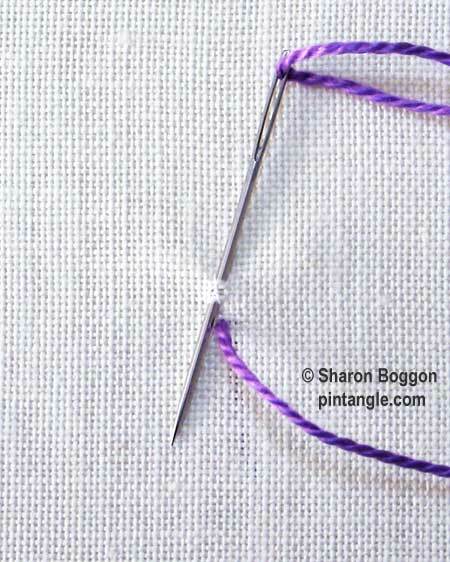 Once again you are whipping the stitch so make sure do not pick up any fabric. Whip the second time and continue the row. I hope you enjoy Portuguese Stem Stitch as I do! 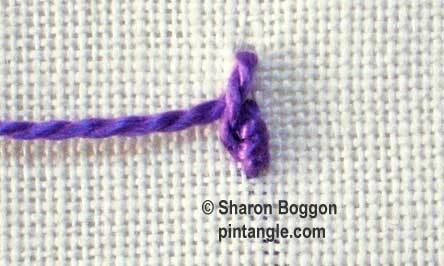 A most enjoyable stitch, but why do some call it Portuguese Knotted Stem Stitch, there is no knot in it? Thanks Sharon for these instructions! I really like this stitch and will try using it again! Looking forward to doing this one. Here are my samples for TAST 70, and 72. Thanks Sharon.